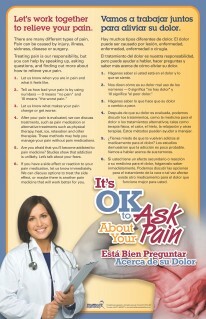 The Joint Commission® requires that a patient's physical pain be assessed and reassesed in an ongoing manner. Our pain tools are the best way to measure, communication, and document patient pain levels. 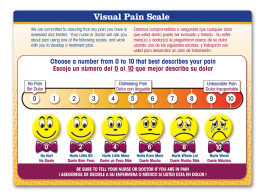 Your patients will be able to communicate their level of pain by referring to the measurement gauge (adults) or descriptive faces (perfect for children or the cognitively impaired). 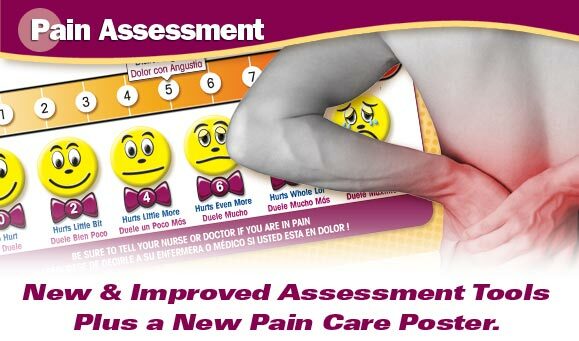 Our Pain Assessment Tool, Badige™ Card and Pocket-Guide to Pain Assessment all include the FLAAC Scale, a behavior pain assessment scale that is used to evaluate pain in non-verbal patients. 2 Storage Options: Acrylic Wall Frame for the Pain Assessment Tool and a Pear Clip for the Pocket-Guide to Pain Assessment. Engage the most important person on your team—the patient. 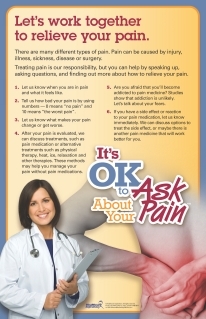 Let patients know that “It's OK to Ask” about the effectiveness of their pain management, while meeting two Joint Commission® standards: pain management and engaging patients and families in their care. 2 sizes available: 16x24" 20x30"